What's on this Autumn Season. Season starts March 4th-7th. ____________________________________________________________Wednesday Night Mixed Netball to return this Summer! Mixed Netball will return to two nights a week starting this October with the Wednesday night Summer competition resuming. Competition Rules: Team must play with between 1-3 males on the court at any time. Price: $70 per team per match. $70 Team Registration Fee (waived if team is playing both nights!). No Individual Registrations or Memberships. Register your team right now. We are also accepting Individual Registrations here. 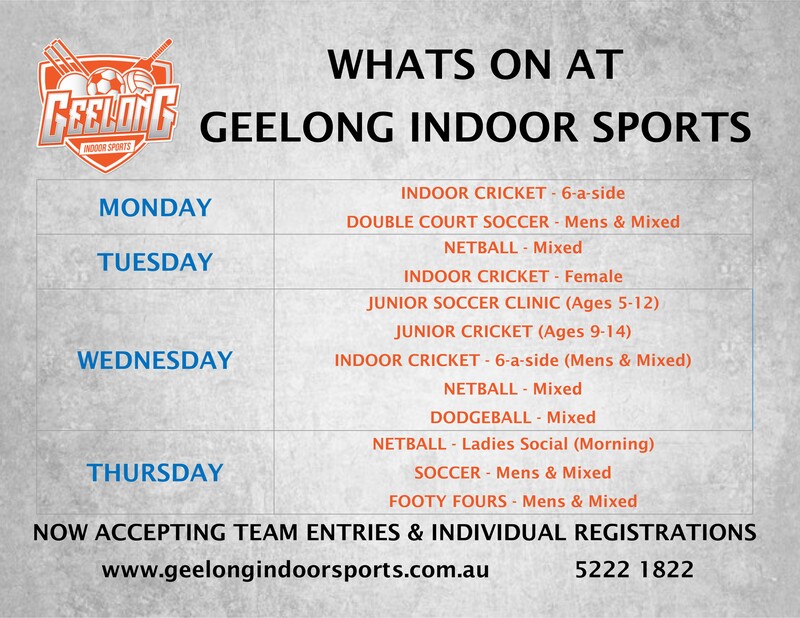 For the first time Geelong Indoor Sports will this year be hosting trials for the Victorian Junior Indoor Cricket teams who will be playing in the National Championships in Toowoomba, QLD in July 2018. This has been done to ensure players who live in the Western Region of Victoria have the opportunity to trial and are not hindered by large travel times to the Eastern side of Melbourne.